UPDATE: Due to recent rains and more possible rainfall, Highland Lakes Habitat for Humanity has canceled its work day Saturday, Sept. 15. Officials hope to have a work day at the Avenue M site on Wednesday, Sept. 19, starting at approximately 7:30 a.m.
MARBLE FALLS — A good home starts with a good foundation. In the case of two Highland Lakes Habitat for Humanity projects, it took a community effort to get the foundations poured. Gorrell stood back and watched as Pete Mancha’s crew from Mancha Concrete worked in another load of concrete donated by Lauren Concrete for the porch area of one of the two homes on Avenue M. He, Mancha and his crew, as well as Lauren Concrete workers, arrived well before dawn Sept. 6 to pour the foundations for the two homes. “We just need to get this one poured,” said Gorrell, referencing the porch of one home. 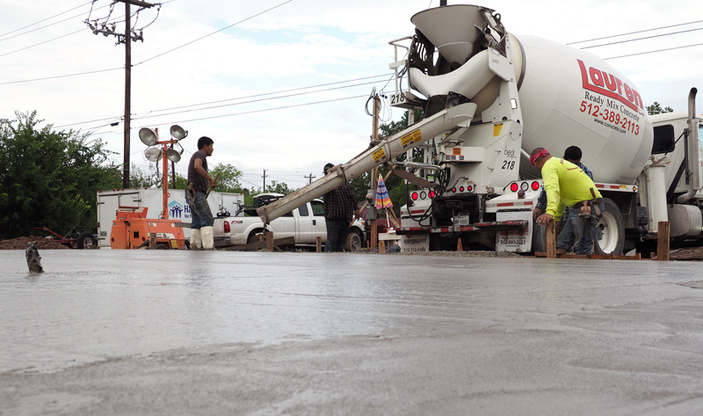 The crews had already poured and worked in about 20 yards of concrete that Lauren Concrete had donated for the two foundations. Lauren Concrete’s contribution comes to about $2,000 worth of concrete. Habitat for Humanity has already chosen the two families for the homes. Work is scheduled to begin Wednesday, Sept. 19. (It was originally set for Sept. 15 but was postponed due to weather.) The start date on the second is possibly later this fall. Habitat for Humanity builds low-cost homes for qualified families, but it doesn't just give them to the families. A family must provide a certain number of hours of work on someone else's Habitat for Humanity home before construction starts on their own. Then, they must also work on their home. Habitat for Humanity offers an interest-free, 20-year mortgage to the family. Both of these homes will have three bedrooms, two baths, and 1,232 square feet. Though identical in floor plans, Gorrell said each will be personalized a bit. These two homes came with a unique challenge for Habitat for Humanity officials. Unlike the home already built beside them, these two are in the flood plain. This is an area where the community effort really shined. The city worked side by side with Habitat for Humanity as did others to design and engineer the two homes so they could be built in the flood plain in a way the owners wouldn’t be forced to purchase federal flood insurance each year. One alteration to the two latest projects is pouring foundations that will be above the flood plain. Plus, Reinders said, they had to engineer the two lots so they didn’t negatively impact nearby lots in case of flooding. But there’s still work to be done, and volunteers are always welcome. You don’t need to be an experience builder or even have any experience at all. Crew leaders will show you the ropes as you help build not just a house but a family’s home. Go to hlhabitat.com for more information or to learn how to volunteer or otherwise support Highland Lakes Habitat for Humanity.